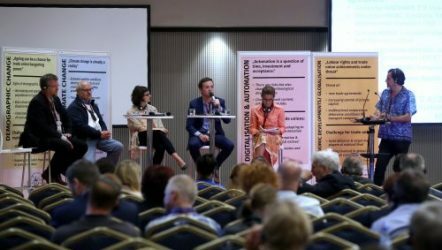 Automation and digitalisation, globalisation, climate change and demographic change were all up for discussion at the second #ETF2017 roundtable event, this time themed around sustainable transport. ETF Vice President Alexander Kirchner was joined at the table by representatives from the European Federation Transport and Environment (T&E), the Federation of European Private Port Operators FEPORT, European Trade Union Institute (ETUI) Barcelona’s Transport Councillor. Meanwhile there were calls for labour organisations to lead the way on the changing nature of work to prevent the inevitable change ‘being destructive’. The EU co-funded ETF project TRENDS – anticipating the impact of changes in transport on employment, working conditions, professions and skills took place in the period November 2015 to April 2017. The project’s main aim was to develop a strategy to anticipate changes in the transport sector regarding economic developments & globalisation, technological change: automation & digitalisation, demographic change and climate change. These changes will all impact transport employment, working conditions, skills needs and will bring a shift in the transport professions. The analysis of major developments related to the four and trends is published in a study you can find in English, French and German. The discussion paper TRENDS – Anticipate and Act is available in English, French, German, Romanian and Turkish. It summarises the study and develops suggestions for trade union actions.